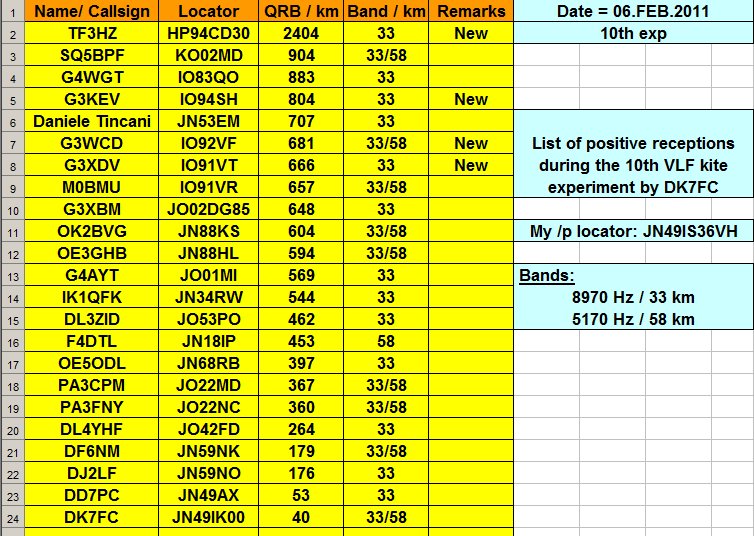 Some recent milestones with amateur radio experiments at VLF. 2010-10-02 DK7FC/P SQ5BPF 8970 904 Stefan's 7th kite transmission. New carrier detection distance record. First VLF signal detection Germany to Poland. 2010-10-23 DK7FC/P EI8JK 8970 1310 Stefan's 8th kite transmission. New distance record at 8970. DFCW-600. First use of GPS locked transmission. 2010-10-23 DK7FC/P SQ5BPF 5170 904 Stefan's 8th kite transmission. First use of 5170 Hz. Received by 6 stations. 2011-02-07 OE5ODL TF3HZ 8970.03 2766 First VLF Austria to Iceland. OE5ODL with 80m balloon. 2011-02-17 OE5ODL 4X1RF 8970.03 2478 First VLF Austria to Israel. OE5ODL with 125m balloon. 2011-03-04 G3XIZ Todmorden, UK 9090.91006 218 Signal detection, 9.6 sigma in 70uhz, 0.2fT. UK distance record. 2013-12-31 DF6NM DK7FC 8970.000 175 OPDS-4H. First use of Opera at VLF. -58.3dBOp 100% 17.0dB. 2014-05-30 W4DEX KE4RJQ 8970.1000 254.2 First strong sub-9kHz transmission in North America. Carrier detection at Forest, VA.
2015-01-07 DF6NM Todmorden, UK 8280/8340 1028.4 Path length measurements from group delay. 2017-01-28 DK7FC RN3AUS 8270.005 1985.6 First VLF detection, Germany to Russia. 2017-04-03 DK7FC 970 7.2 First experiments on 970 Hz. 7.2 km S/N 30dB in 424 uHz. 2017-04-21 DK7FC 970 14.4 Distance record for 970 Hz. S/N peak 18dB in 424uHz. 8270.00513889 Combining coherent signals from two stations to produce a rotating beam. 2018-04-04 DK7FC Moonah,Tasmania 17470.1 16805 Record distance for carrier detection at VLF. 12 daily repeats, 19:20 to 21:50 UT for 30 hours total. 14.13 dB in 111.1 uHz. ERP between 2mW and 4mW. 2018-09-29 DK7FC 970.1 55.6 Carrier detection 13.03dB S/N in 139.5 uHz. First far field detection at 970Hz. 2017-12-10 DK7FC KE4RJQ 17470.1 6817.7 1 First transatlantic VLF signal east to west. 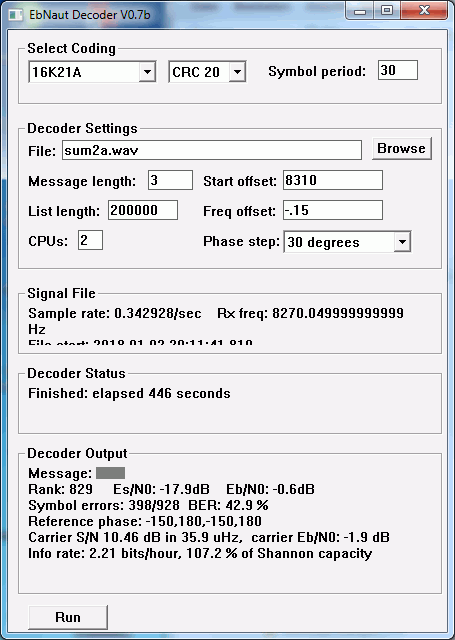 World record distance for message decode. EbNaut 16K21A, 1 character, 60 second symbols, CRC 10 bits. Eb/N0 = +1.5 dB, rank 9 in the list decoder. 2017-12-22 VO1NA DL4YHF 8270.0075 4301.5 1 First VLF message Canada to Germany, EbNaut 16K21A 1 character 60 second symbols Eb/N0=+4.7dB. 2017-12-22 VO1NA SQ5BPF 8270.0075 5096.6 1 First VLF message Canada to Poland, EbNaut 16K21A 1 character 60 second symbols Eb/N0=+1.0dB. 2017-12-23 VO1NA IK1QFK 8270.0075 4533.4 1 First VLF message Canada to Italy, EbNaut 16K21A 1 character 60 second symbols Eb/N0=+1.6dB. 2017-12-26 VO1NA RN3AUS 8270.0075 5810.5 1 First VLF message decode Canada to Russia. 1 char EbNaut 16K21A CRC8 60 second symbols. 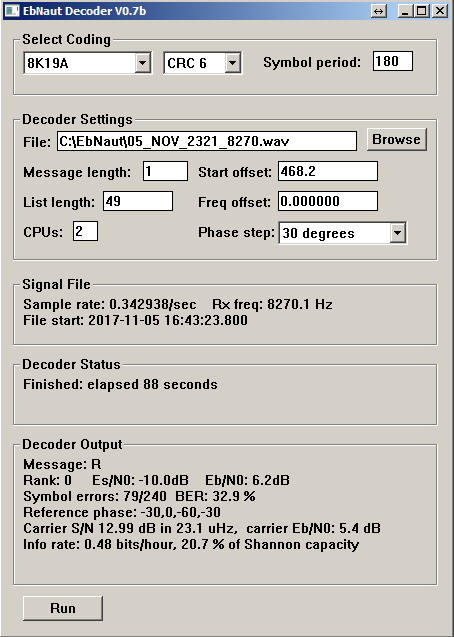 Eb/N0 = 5.36 dB with two repeats of the message stacked. 2017-12-28 VO1NA KE4RJQ 8270.0075 2415.3 1 First VLF message decode Canada to USA. 1 char EbNaut 16K21A CRC8 60 second symbols. Eb/N0 = -0.1 dB. New distance record for North America. 2018-01-04 VO1NA Hawley, Texas 8270.0075 4240.3 1 New distance record for 36km band message decode in North America. New world record distance for message decode over land path. EbNaut 16K21A 1 char 60 second symbols CRC 8, with 7 repeats stacked to give a decode at Eb/N0 -0.7 dB. 2018-02-19 DK7FC W1VD 8270.1 6096 1 First E/W transatlantic reception and message decode below 9kHz. Single character EbNaut 16K21A with 32 second symbols and CRC 24. Eb/N0 +2.5 dB rank 31465. 2018-04-06 DK7FC Moonah, 17470.1 16805 1 Record distance for VLF message decode. EbNaut 16K21A, 15 second symbols, CRC16, 1 character, Eb/N0 +0.8 dB, BER 42.7%. 2017-02-10 DK7FC RN3AUS 8270.1 1990 2 First VLF message, Germany to Russia. 30 seconds 16K21A 32 bit CRC 2 chars Eb/N0 = +1.13dB. 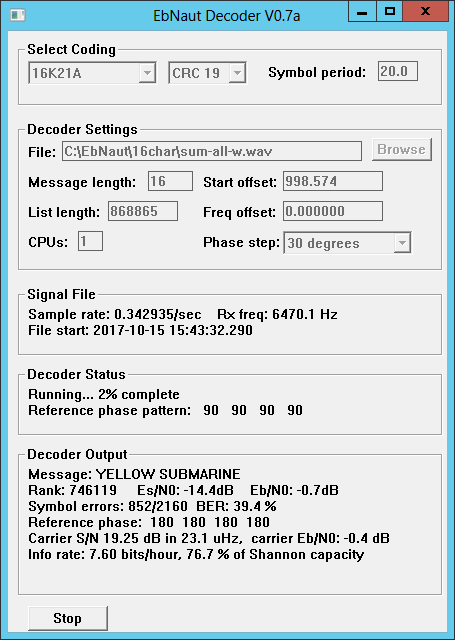 2017-03-23 DK7FC RN3AUS 6470.1 1985.6 2 Distance record for message decode at 6470 Hz. 2 chars 16K21A S=40 CRC=32, Eb/N0 = +0.4 dB. 2017-04-19 DK7FC SQ5BPF 6470.1 919.3 2 2 character message, 16K21, 30 second symbols Eb/N0 = 1.6 dB, new distance record at 6470 for EbNaut. 2018-01-19 DK7FC IK1QFK 4470.1 505 2 First message decode Germany to Italy at 67km band. Eb/N0 +5.0 dB. 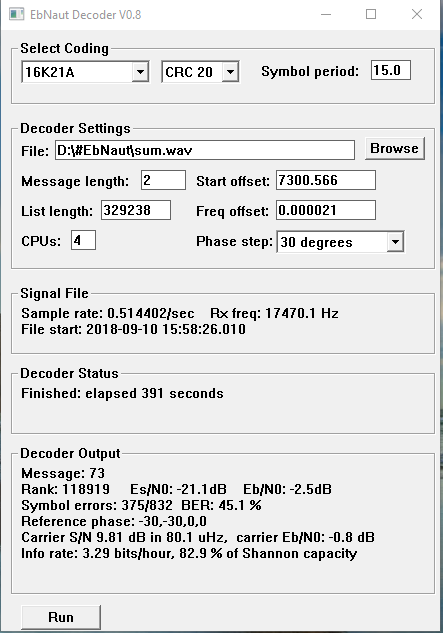 2018-01-19 DK7FC Todmorden, UK 4470.1 881 2 Distance record for message decode at 67km band. 2 chars EbNaut 16K23A with 30 second symbols. Eb/N0 +3.8 dB. 2018-02-23 DK7FC W1VD 8270.1 6096 2 Record message length E/W transatlantic: 2 characters EbNaut 16K21A 30 second symbols CRC22. Three nights stacked to produce Eb/N0 = 0.62 dB. 2017-01-24 DK7FC DL4YHF 2970.000 303.8 3 ULF distance record for decode, 3 chars 16K25A +2.4dB. 2017-08-12 DK7FC DL0AO 3675.005 226 3 First amateur operation at this frequency. 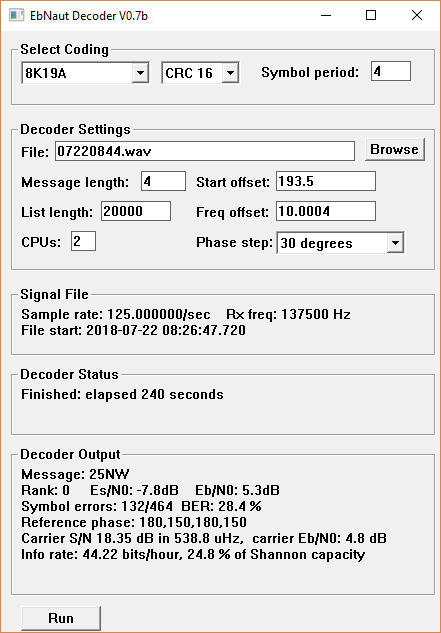 Carrier detection and EbNaut decode 3 chars 16K21A CRC7 Eb/N0=-0.5dB. 2017-12-14 IW4DXW Todmorden, UK 8270.00332 1412.6 3 First Italy to UK VLF message, EbNaut 16K21A 3 chars 30 second symbols Eb/N0=+1.8 dB. 2017-12-24 DK7FC IK1QFK 5170.1 504.6 3 First message Germany to Italy on 58km band. EbNaut 16K21A CRC11 60 second symbols 3 chars. Eb/N0=+5.0dB. 2017-12-25 DK7FC SQ5BPF 5170.1 919.3 3 First message Germany to Poland on 58km band. EbNaut 16K21A CRC11 60 second symbols 3 chars. Eb/N0=+2.2dB. 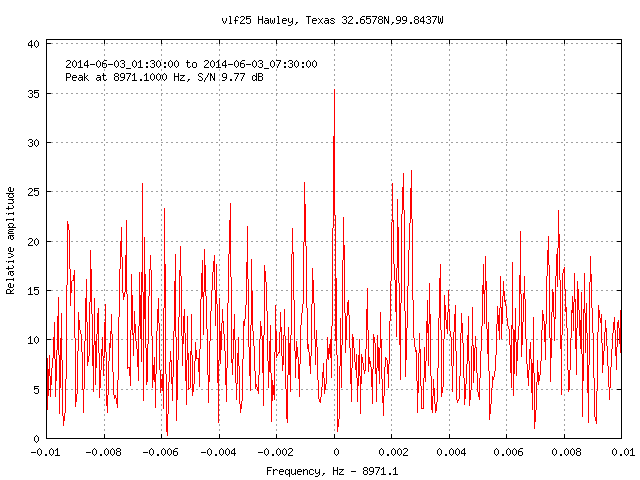 2017-12-27 W4DEX Hawley, Texas 8269.9 1816.2 3 Record distance in North America for VLF message decode. Eb/N0 +5.7 dB. 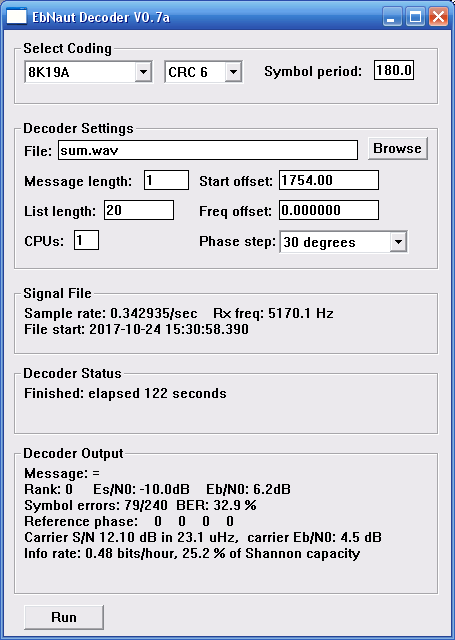 2017-12-27 W4DEX IK1QFK 8269.9 7173.4 3 New world record distance for message decode at VLF. 3 characters by EbNaut 16K21A CRC20 30 second symbols. Eb/N0 +0.4 dB. World record distance for EbNaut at all bands. 2014-12-29 W4DEX KE4RJQ 8822.000 254.2 4 First use of EbNaut in North America. 16K25A 9 seconds 4 chars. Eb/N0 = 6.3dB. 2011-11-27 DF6NM Todmorden, UK 8970.002 1031.5 5 First MFSK at VLF. Germany to UK. Kite transmission. 5 chars in 25 minutes. MFSK-37 with 300 second characters. 2014-05-10 DF6NM Todmorden, UK 8270.000 1028.4 5 First use of EbNaut at VLF. 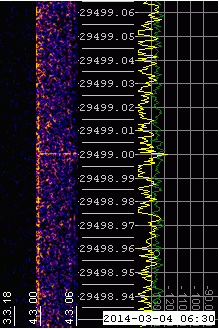 Two messages, 4K21A 5chars 30 second symbols, Eb/N0 -0.5dB and -1.5dB. 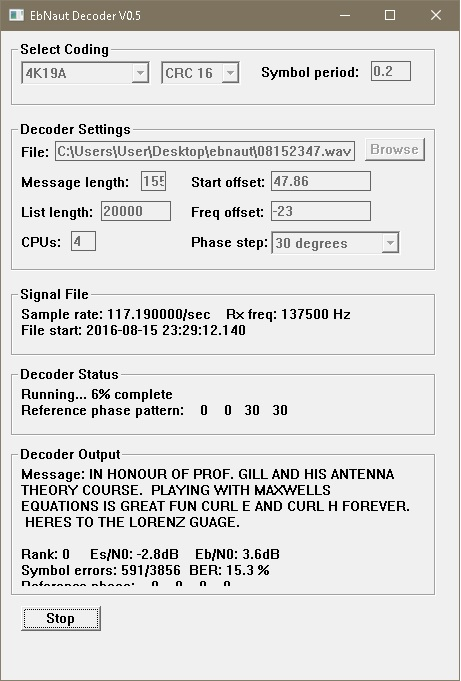 2017-05-18 DK7FC 970 27.2 5 Distance record for 970 Hz and message decode. 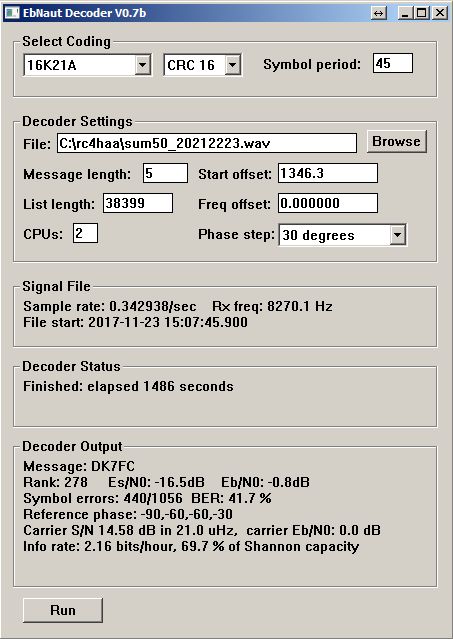 EbNaut 5 chars 16K21A CRC=4 100 second symbols, Eb/N0=2.1 dB, -71.2dB in 2.5 kHz. 2017-08-23 DK7FC DL0AO 4470.005 226 5 EbNaut decode 5 chars 16K21A CRC6 60 second symbols Eb/N0=0.3dB. 2017-11-06 VO1NA Todmorden, UK 8270.0075 3575.5 5 Longest T/A message sub-9kHz CA to UK. 10uW ERP. EbNaut 5 chars 8K19A CRC16 symbols 26 seconds, Eb/N0=+1.8 dB. 2018-03-24 K3RWR DF6NM 137395 6736 5 Record distance for EbNaut at LF. 5 chars 8K19A CRC24 3 second symbols. Several overnight decodes. Best Eb/N0 11.9 dB. 2018-10-21 DK7FC 970.1 57.6 5 16K21A 10 second symbols CRC18 Eb/N0 +2.6 dB. 2015-08-16 IZ7SLZ DF6NM 137502.0126 1059.2 6 First successful EbNaut message on LF. 6 chars 8K19A 3 second symbols Eb/N0 = 5.8dB. First coherent BPSK at LF. 2015-11-24 VO1NA IZ7SLZ 137776.99968 5418.2 7 LF distance record for EbNaut. Eb/N0 = 1.4dB, 8K19A 7 chars 2 second symbols. 2019-04-06 DK7FC/P Todmorden, UK 2970.1 840 7 First ULF message Germany to UK. EbNaut 16K21A CRC16 7 chars 6 second symbols. Eb/N0 +1.0dB, BER 39.1%. Transmit using 2.44A into 1130m ground loop, 487 W TX power. 2016-03-03 VO1NA IZ7SLZ 477700.0000 5418.2 10 MF distance record for EbNaut. Several decodes with Eb/N0 from 3.6dB to 17.9dB. 4K19A 10 chars 2 second symbols. TX 30 Watts to 100m rotated L mean height 15m. 2017-12-31 DK7FC IK1QFK 5170.1 504.6 12 Record message length Germany to Italy on 58km band. EbNaut 12 chars, 16K21A, Eb/N0 -0.1 dB with two repeats stacked. 2018-01-15 DK7FC RN3AUS 5170.1 1985.6 12 Record message length from Germany to Russia on 58km band. 12 chars EbNaut 16K21A CRC20 30 second symbols. Stacked 17 overnight repeats to obtain Eb/N0 -0.27 dB. 2018-03-30 K3RWR IZ7SLZ 137490 7612 12 Record distance for EbNaut decode. 12 chars 8K19A CRC15, 2 second symbols. Eb/N0 -0.4 dB, S/N -14.3 dB in 1Hz. 2014-05-18 DF6NM Todmorden, UK 8270.000 1028.4 14 First use of 8K25A, 15 second symbols 14 chars. Eb/N0 = -0.4dB. 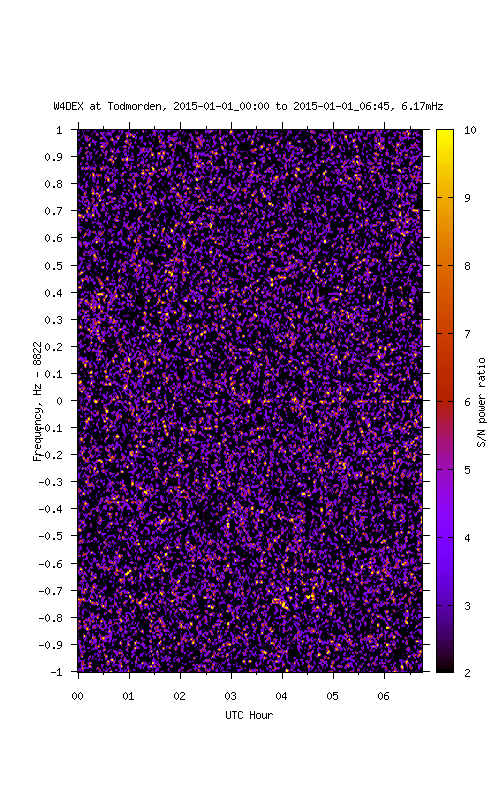 2015-09-19 IZ7SLZ DF6NM 137502.12/137510.00 1059.2 21 First 2-way contact using EbNaut. 8K19A 21 chars, 1 second symbols. Eb/N0 from 1.6 to 11.0dB. 2015-11-15 IZ7SLZ DF6NM 478499.93 1059.2 22 First EbNaut 2-way contact using MF. 8K19A 22 chars 0.3 second symbols. Eb/N0 from 2.0 to 15.8dB. 2018-03-26 K3RWR DK7FC 137395 6736 30 30 chars 8K19A CRC18 with 2 second symbols. Eb/N0 +4.0 dB. 2018-03-26 K3RWR IW4DXW 137395 7031 30 Record distance for EbNaut at LF. 30 chars CRC18 with 2 second symbols. Eb/N0 +5.4 dB. 2017-04-19 DK7FC Todmorden, UK 6470.1 881 40 40 character message using 16K25A, 4 second symbols Eb/N0 = 0.0 dB. Longest message at 6470 Hz. 2017-05-07 DK7FC Todmorden, UK 6470.1 881 75 Longest EbNaut message at 6470, 75 chars 8K19A S=15 CRC=2, Eb/N0 = +0.8 dB. 2017-05-05 DK7FC Todmorden, UK 8270.1 881 100 Longest EbNaut message at VLF, 100 chars 8K19A S=10 CRC=0. Eb/N0 = +0.2 dB. 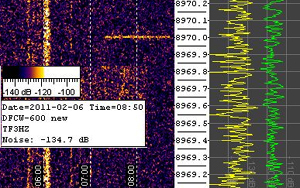 2017-11-03 DK7FC Todmorden, UK 5170.1 881 100 Longest message at 58km band. EbNaut 100 chars 8K21A with 8 second symbols. Five nightly transmissions stacked to give Eb/N0 = -0.2dB, BER 32.7%. 2017-11-14 DK7FC Todmorden, UK 8270.1 881 300 Longest message at VLF. EbNaut 300 chars 4K19A, 6 second symbols, CRC16. Two overnight transmissions stacked to give Eb/N0 = +1.7dB, BER 21.4%. Averaged 70 info bits per hour.